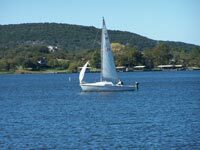 The Highland Lakes are about as good as it gets in Texas and they offer lots of fun things to see and do for a Texas weekend or vacation. The Highland Lakes are a chain of seven lakes which were formed when the Lower Colorado River Authority built a series of dams along the Colorado River in the 1930's and 1940's. The lakes and dams are listed below from west to east and upstream to downstream. The table also has a link to Texas Outside's Review of the Lake and a link to an interactive lake map with lots of fun things to see and do on the lake. All of the Highland Lakes are located in some of the prettiest parts of the Texas Hill Country and are an easy drive from Austin - from the tip of Lake Buchanan to the dam at Lady Bird Lake is about 100 miles. The surrounding communities are laid back, small, and country friendly. You won't get bored when you set out to explore the Highland Lakes for a weekend or a week long vacation. You can boat, bike, hike, swim, fish, hunt, or explore a cave, sample some award winning wine, stay in a 4 star resort or a cabin on the water, rent a boat, hire a fishing guide, play some of the best golf courses in Texas, ride a zip line across Lake Travis, devour some fantastic food, shop till you drop, listen to live music in a fun bar, attend a fun music festival or special event, and lots more - see our list of Top 25 Things to See & Do in the Highland Lakes. You can also use this map of the Highland Lakes to find lots of fun things to see and do. Starting at the top, here are some of our comments about each of the Highland Lakes. Lake Buchanan is the largest of the Highland Lakes and it's home to some good fishing, several older but comfortable resorts and cabins, and a couple campgrounds. 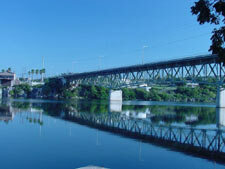 Lake Buchanan is renowned for excellent bass fishing. The lake harbors distinct embankments of sand, rock, and ledges and coves thick and thin with marine growth. You can rent kayaks or take the Vanishing River Cruise up to a waterfall and some scenic terrain, spot eagles soaring in the hills, stay in a resort or camp, or rent a boat or hire a fishing guide. There is some stunning scenery at the far north end of the lake. If the wind isn't blowing, you'll find some smooth water for boarding. Here is a link to the review of Lake Buchanan and an interactive Lake Buchanan map to find stuff on the lake. Next is Inks Lake which is one of the smallest of the Highland Lakes. We love this small lake for boarding, short scenic cruises, and it's coves for swimming. Plus it is a constant level lake. But best of all is Inks Lake State Park which makes a visit to Inks Lake a must if you like to camp. They have lots of sites on or close to the water, a ramp, store, kayak rentals, trails, lots of trees, and an inexpensive 9 hole course with a few holes along the lake. There isn't a lot of aquatic vegetation so the fishing isn't the best - come here to camp, swim, enjoy the scenery, visit nearby Longhorn Caverns, or just relax. Read our review of Inks Lake and Inks Lake State Park to learn more. The Colorado River leaves Inks Lake and joins the Llano River to form one of the other few constant level lakes in Texas. 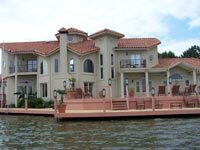 Most of Lake LBJ is developed with beautiful stunning homes. If you like to gawk at the rich peoples homes, cruise the Colorado arm or around and through the tunnels under the roads in Horseshoe Bay. The Llano River arm has warm water and a sandy bottom the farther north you go. The Sunrise Beach arm has a party beach that on the weekends is loaded with boats and people having a blast in the water. There are a few small coves for boarding or dropping an anchor and swimming. The Colorado River arm is narrow and busy with boats and boarders/tubers. There are several places to rent boats or rental property, LBJ Resort has a drive up restaurant, and the Marriott Resort has a fantastic pool and beach on the lake for resort guests. There are several great courses around the lake - use this golf map to find them. Here is a link to our LBJ Map and Lake LBJ Review. The Lake LBJ dam is the starting point for Lake Marble Falls which is a short narrow 6 mile stretch of the Colorado River that passes through Marble Falls. Some homes line one side, there is an RV park at the bridge that leads into Marble Falls, and River City Grill sits on a small bluff overlooking the lake - a great place for food and live music. Marble Falls is home to some great restaurants, fun nightlife, and quaint shopping area, plus motels and other lodging. Lake Marble Falls is seldom crowded and it's typically a great lake for boarding, tubing, or skiing or a short cruise, but there is not much else to see or do on Lake Marble Falls. Next in the chain of Highland Lakes is the party lake of Texas - Lake Travis. The Colorado River and lots of tributaries have cut and carved and shaped Lake Travis out of the rolling hill country and created a scenic and beautiful lake dotted with stunning huge homes. The limestone bottom makes Lake Travis one of the clearest lakes in Texas and it is also the second deepest lake in Texas at 210' - Lake Amistad is first at 217'. As such Lake Travis is great for all water related recreation including scuba diving (by the dam is best). 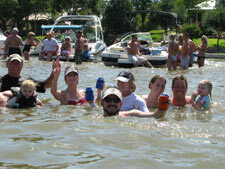 Devils Cove is the "Party Cove" of Texas and it's packed on weekends with lots of boats and people out for a good time. Lake Travis also has several restaurants on the water, the longest zip line in Texas, fun bars, a water park, Lakeway Resort, rental homes, Pace Bend Campground, and lots more. The bad news is that the water fluctuates dramatically - in June 2012, the lake was down 45'. 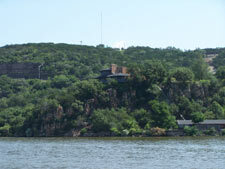 Here are a few of our favorites on Lake Travis - Devils Cove for a party; for a thrilling zip across canyons and inlets; The Oasis for music and a sunset overlooking the lake; Hippy Hollow if you like clothing optional beaches; and Just for Fun Boat Rentals to rent a party barge, wave runner, or houseboat. 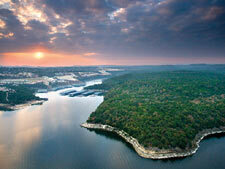 Here is a link to our review of Lake Travis and to our Lake Travis Map to find the above and more. Lake Austin is a 20 mile long and narrow stretch of the Colorado River that cuts through the Austin hills, past some multi-million dollar homes, and ends at the dam where there are a couple fun and lively restaurants on the left and a small cove on the right. The water is really cold near the Lake Travis dam but this section of Lake Austin is typically less crowded and excellent for boarding, tubing, and skiing - the rest of the lake can get crowded and choppy. You can boat or drive up to Ski Shores, Abels on the Lake, County Line, and Hula Hut for some food and there are some boats available for rent if you don't have one. 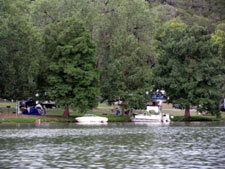 Emma Long Metropolitan Park has campsites right on the water. 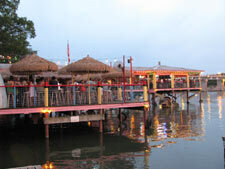 Lake Austin is a great lake for cruising, boarding, and boat up restaurants. Read our review of Lake Austin to learn more. Lady Bird Lake is the final lake in the Highland Lakes chain and it flows six miles through Austin and ends near downtown. It's a narrow and shallow (14 feet) and swimming and boating are not allowed but you can rent or use kayaks and stand up paddle boards on the lake. There over 10 miles of great trails for biking, jogging, or walking around the lake, several restaurants and shops nearby, a cruise boat, hotels on the lake, several parks, and nearby bike rentals. With so many incredible attributes it is hard to find something not available in the Highland Lakes region. A multitude of outdoor activities over diverse landscapes, or astonishing culture and traditional cuisine constructs a unique vacation destination for long and short-term stays. Another attraction often overlooked is comfort and convenience. Have a fantastic vacation on the Highland Lakes. Click on almost any portion of the map below to get more information or to see an enlarged view of that section of the Highland Lakes.